I have said it before and I will say it again, we love Hasbro's PLAY-DOH around our house! It is one of the go-to things for us when we need a nice sit down activity that both the boys can play with. 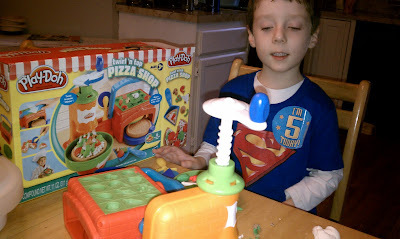 There are all kinds of products from Play-Doh but this time we were playing with the Play-Doh Twirl N' Top Pizza Shop. JJ loved the idea of all of the toppings he could make for his personal pizzas He made pizza for the whole family according to our requests, this really did keep him busy for quiet a long time. 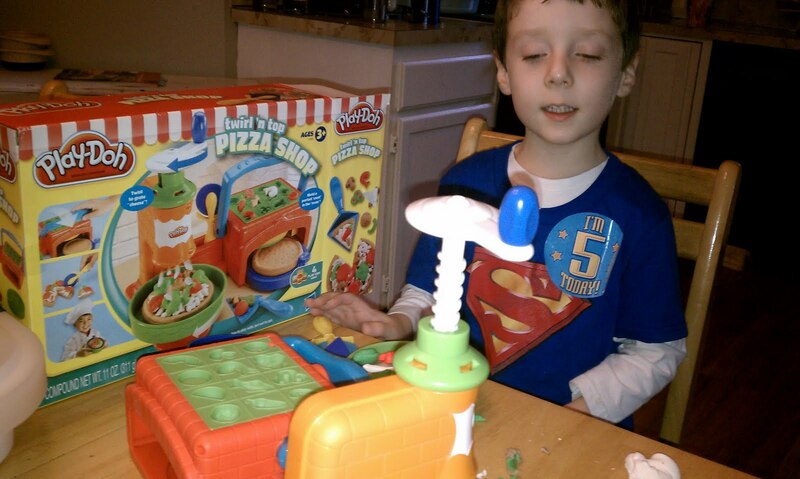 Whip up some delicious fun with this pizzeria set! Mold the perfect "crust" in the "oven," grate "cheese" with the cheese sprinkler tool and then use the molds to create tons of "toppings." Pile your "pizza" high, serve it and slice it — then start all over again! How many different kinds of "pizza" will your pizzeria serve up? Includes oven, cheese sprinkler, sprinkler handle, dish, server, cutter, pan, instructions and 3 two-ounce cans and 1 five-ounce can of PLAY-DOH Brand Modeling Compound. Need a gift idea? 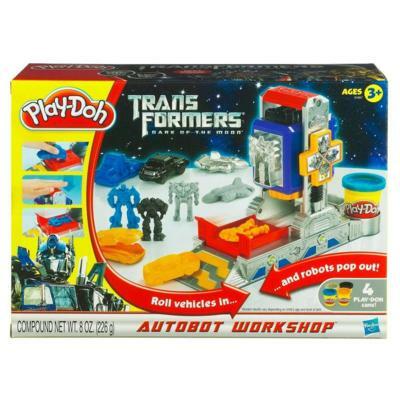 How fun would the Play-Doh Transformers Dark of the Moon Autobot Workshop be! There has not been a product put out by Play-Doh that we have not had a blast with! There are so many products to chose from. On Play-Doh's website you can narrow your search by Brand, Product Category, Age, Gender and Price, very helpful. We love Play-Doh! 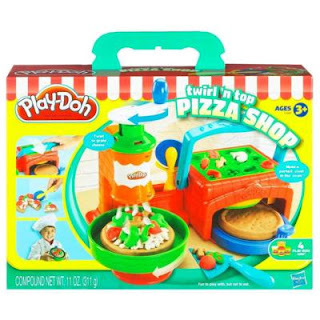 Win a Play-Doh Twirl N' Top Pizza Shop set. What other Play-Doh set would you love to have? *Limited to US residents; 18 years old and above. Giveaway starts November 22, 2011 and ends on December 3 , 2011 at midnight PST. Winner will be emailed and has 48 hours to respond before another winner is selected. I was not paid for this giveaway or post. The opinions on this item are 100% mine and may vary from others. The sponsor is responsible for providing the prize. i like the Sesame Street Cookie Monster's Letter Lunch Playset. I'm a twitter follower as @sablelexi. I like the cookie monster letter set too! I would also love the Magic Swirl Ice Cream Shoppe! So fun! I like Play-Doh on Facebook! My daughter would like magic swirl ice cream shop. I would love the cake-making set! I liked Playdoh on FB. The PLAY-DOH SESAME STREET Fun Shapes Bucket would be great to have! The ice cream set would be fun. Would also love the cake makin station for my kids to play with while I'm baking cakes!!! My little girl would love the PLAY-DOH FUN FACTORY SPIN 'N STORE (Blue) Playset! I would like to have the ice cream set also for my daughter. That pizza set looks so cool! My little cousin loves the Transformers, so I'd love that PlayDoh set!!! The drill & Fill set looks super fun - my kids LOVE all play doh products!! I like the PLAY-DOH Sesame Street Cookie Monster’s Letter Lunch Playset. I'd like to have the ice cream shoppe set! So fun! I like the ice cream shoppe set. I like play dough on fb. I like the new facebook page. The doctor drill and fill looks like a blast! My kids really want the Doctor Drill N Fill! my boys would also love the magic swirl ice cream shop! I love the tonka chuck and friends playset.Thanks! I like play-doh on FB as Leslie Luke Stanziani.Thanks! I like you on FB as Leslie Luke Stanziani.Thanks! My kids would love the Magic Swirl Ice Cream Shoppe Playset. Thanks! I would love to have the Sesame Street Color Mixer or the Dentist Drill 'n Fill set! "Liked" Play-Doh on Facebook as Tiffany Byrd Church! I follow via GFC as Tiffany Church. I liked your Facebook page as Tiffany Byrd Church.